We had a pet, a green iguana named the Green Hornet. While an iguana is an interesting pet they aren’t warm and fuzzy. I wanted a dog, any dog, preferable from a shelter and not a puppy. One that was 11/2 – 2 years old, housebroken and all that fun stuff already taken care of since both my husband, Ernie, and I work. 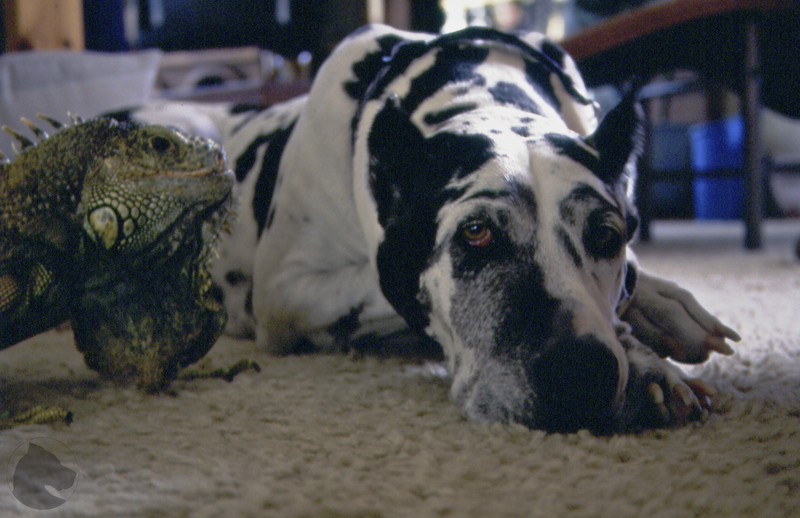 It quickly became apparent that not just any dog would do for Ernie, he wanted a Great Dane. There weren’t any in the local shelters so I found a rescue and off we went to spend the day picking out a dog. It was a 11/2 hour drive and then after introductions, meeting their pack of dogs and an informal interview we got to start seeing the adoptable dogs one at a time. I don’t remember how many we ended up seeing, close to 15, but the first time Selar came around the corner of the house I heard Ernie’s breath draw in. She was a gorgeous harlequin with cropped ears, we were hoping for floppy but certainly not a deal breaker. She was happy to meet like all the dogs were. She went back in and a few more dogs came out. We decided to have our top 5 picks come out again. Most of the dogs reacted as if “you again, we already met you” but Selar came out just as happy as the first time and had been waiting at the door every time another dog had been brought out. So it wasn’t that we picked her but she picked us. With paperwork signed and adopting fee paid, she hopped in the car and made it her own. The next day she was introduced to our usual Sunday morning activity, hot air ballooning. We were to meet some other balloonists who knew we were going to get a dog the day before. When we drove up you could see the open mouths and wide eyes when Selar stood up in the back, even though she was underweight at 92 lbs. she was still a lot more dog than they were expecting to see. The owner of the rescue suggested we give her a chance to get used to the change and not take her out right away but we weren’t going to leave her home. She had no problems with the noise and activity. That was just the start of all her travels and adventures which included flying, rafting, visiting 10 states, 1 foreign country, 26 National Parks and numerous state parks.